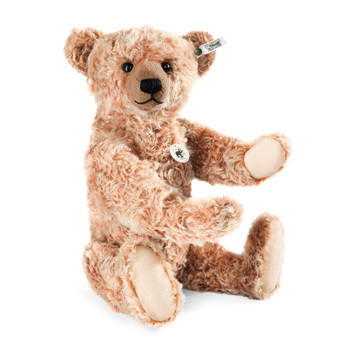 Steiff 1908 Replica Teddy Bear Discounts Apply ! Made from The Finest Light Cinnamon Mohair. A decade ago, a very special Teddy bear was offered for sale at London's most prestigious auction house. Since it was expected to be one of the most desirable items in the sale, the Teddy bear was featured on the cover of the widely distributed auction catalogue. After 10 years of waiting, the time has finally come to present this unique bear to our collectors. It was originally designed in 1908 and is now available as an exact replica of the original. The most unique aspect of this 5-way jointed Teddy bear, who is stuffed with wood shavings, is the elaborate plush developed by Steiff Schulte. Salmon-coloured mohair with gently faded tips and a cinnamon-coloured cotton back lend this unique Teddy bear a wonderful sense of colour. His nose, muzzle and claws have all been stitched by hand. He proudly wears an "underscored button" in ear that reflects the period of his original manufacture. Lovers of classic, traditional bears will definitely want to add this unique example of Steiff artistry to their collections. 5-way jointed with wooden Eyes and stuffed with wood shavings, with growler and with underscored button "Button in Ear" and Surface Washable.